With the Teacher Excellence and Support System (TESS) and Leader Excellence and Development System (LEADS) already in place, Arkansas is collaborating with BloomBoard for the 2014-2015 academic year to increase the impact of its teacher effectiveness programs. Super User Trainings began last week in Arkansas, and has already received much love from both teachers and administrators across the state. For those less familiar with BloomBoard, 'Super Users' are school-selected representatives we train to become expertly proficient at using our platform- so they may return to their schools and pass on the knowledge to fellow teachers. 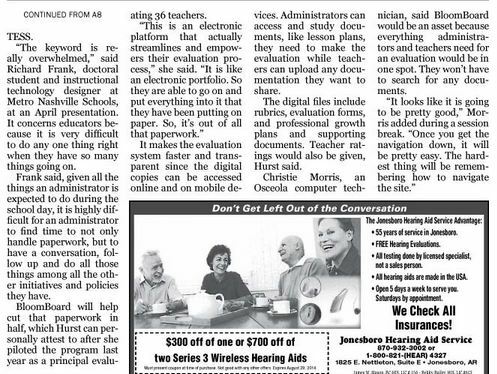 BloomBoard has been embraced not only for its (super) user friendly platform and streamlining of evaluations, but also for making the whole observation and evaluation process more transparent and thereby enhancing dialogue between teachers and principals. 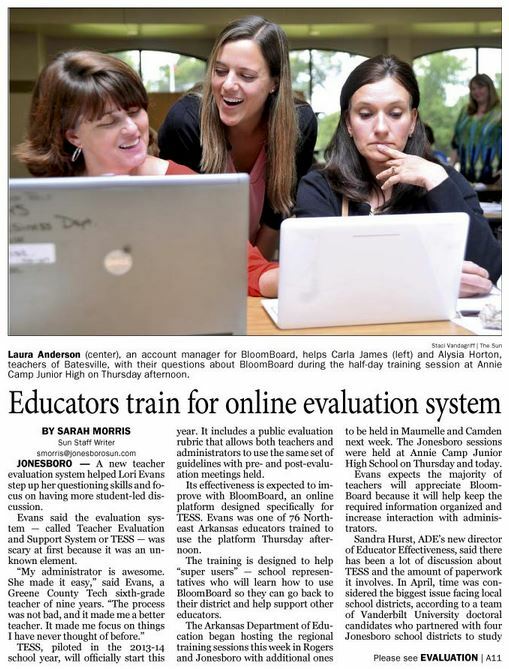 The week's trainings were featured in the article below from Jonesboro Sun. Laura Andersen, BloomBoard Account Manager and former kindergarten teacher, is pictured helping out teachers during the training. See below to read more about what our new super users have to say about their new tools!